When late turns later, and the sun is a mere two hours away, Cookie Monster hits the spot. 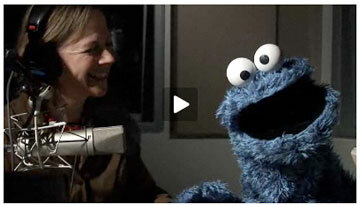 I guess it was Frank Oz, one of the greats, that allowed Cookie Monster to get interviewed by NPR’s Elizabeth Blair. And it was Cookie Monster that didn’t disappoint. Always good for a laugh, and stuck in a one-joke bit that always gets pulled off, Cookie Monster’s comedic timing ranks among the greats. Watching him improv, whether he knew the questions beforehand or not, is a special highlight. Like those moments on Sesame Sreet where the Muppets improv interviews with kids, you can’t miss the sharp skills of Oz, or David Rudman, behind all that blue fur. And, in good timing, the cookie eating bit was a “throwaway,” done in the first third of the interview and not the main focus of the bit. I could go on about Cookie, and write just as much for Oz’s other character Grover, but I’ll just let the monster speak for itself. And eat its way out of every tough question.